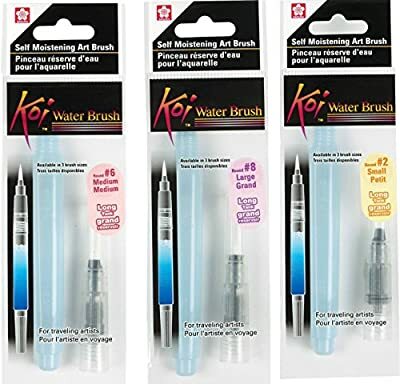 Koi Water Brushes are designed for the easy transportation and storage of water when you're away from home or the studio. The brush separates into two parts: a fine, flexible brush tip, and a barrel handle witha plug to carry the water. The comfortable grip is great for controlled blending, shading, and highlighting. The Koi Water Brush is available in three brush and two barrel sizes for maximum versatility.